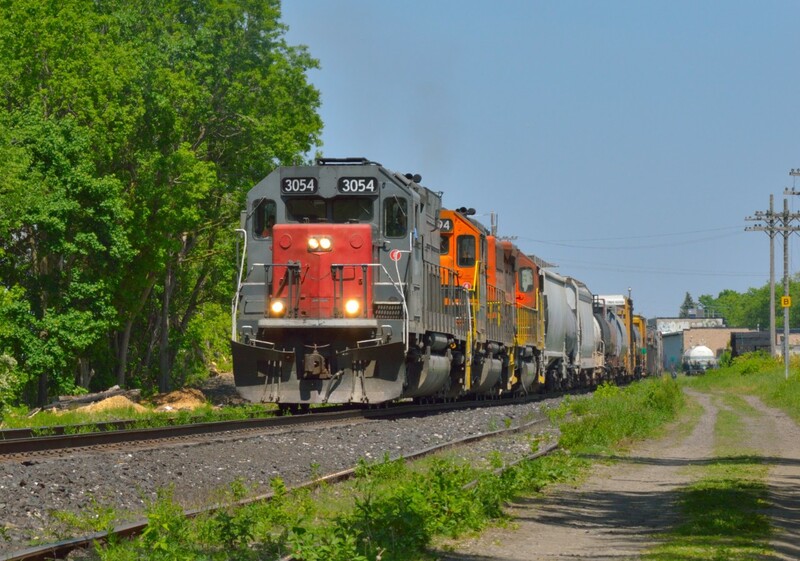 Railpictures.ca - Jacob Patterson Photo: The final ten days are upon the GEXR, but back in May that was still a ways off. 431 in it’s final days is using the same SD-trio pictured here, a far cry from the green and cream Shakespearean GP9′s from the Cartier Railway. The units wore Shakespearean names for “The Festival City,” Stratford: Home of the Stratford [Shakespearean] Festival.177 named ‘Titania’ from A Midsummer Night’s Dream178 named ‘Paulina’ from The Winter’s Tale179 named ‘Portia’ from Julius Caesar and The Merchant of Venice180 named ‘Falstaff’ [Sir John] from Henry IV; parts I & II and The Merry Wives of WindsorToday’s railway, now gone through 3 owners (Railtex to RailAmerica to today’s Genesee & Wyoming) is quite different, geeps have come and gone, now big SD’s ply the line, including Canada’s only SD45T-2, and in 10 days the line returns full circle to it’s original state, orange power being one of the only differences. All the best the crews of the GEXR! | Railpictures.ca – Canadian Railway Photography – photographie ferroviaire Canadienne. Caption: The final ten days are upon the GEXR, but back in May that was still a ways off. 431 in it's final days is using the same SD-trio pictured here, a far cry from the green and cream Shakespearean GP9's from the Cartier Railway. The units wore Shakespearean names for "The Festival City," Stratford: Home of the Stratford [Shakespearean] Festival. Today's railway, now gone through 3 owners (Railtex to RailAmerica to today's Genesee & Wyoming) is quite different, geeps have come and gone, now big SD's ply the line, including Canada's only SD45T-2, and in 10 days the line returns full circle to it's original state, orange power being one of the only differences. All the best the crews of the GEXR! Fair enough, end of GEXR on the Guelph Sub. Thank you! It’s not technically the final 10 days of GEXR though, GEXR will still be operating on the original 1992 Subdivisions! The power will get sent out to other G&W lines. Some will stick around for the Goderich sub though. Any idea where the 3054 will likely go next? Or will the GEXR units be put up for sale and no knowledge of where they will end up until sold.